For the past 2 1/2 weeks I’ve been out of town for business. I missed my cats and my home computer. Right now one of my cats is curled up next to the computer, so I am more content than I have been in a long time. Still, I have suitcases to unpack, laundry to do, and lots and lots of work piled up. I want to keep working on characterization in my memoir, but I don’t have time right now to write a new post. However, I remembered that I have actually written pieces which were not for the memoir which still could inform my book. It’s good to pull together as much material as I can. Maybe you remember my maternal grandmother who I wrote about in Grandma and the Purple People Eaters. Her girlhood dream was to be a writer. She did get a couple of pieces in the newspaper and Reader’s Digest, but didn’t end up considering herself a writer. 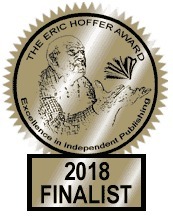 Years after I had gotten my MFA in creative writing, and after I had been sidetracked by raising my kids and teaching, Grandma said to me that she didn’t want me to give up being a writer as she had. I made a promise to Grandma that day that I would never give up writing. That promise is always in the back of my mind and the bottom of my heart. For my book Scrap, Grandma will be a minor character. For my life, she’s been a major character. This is the scrapbook which my parents gave to me. 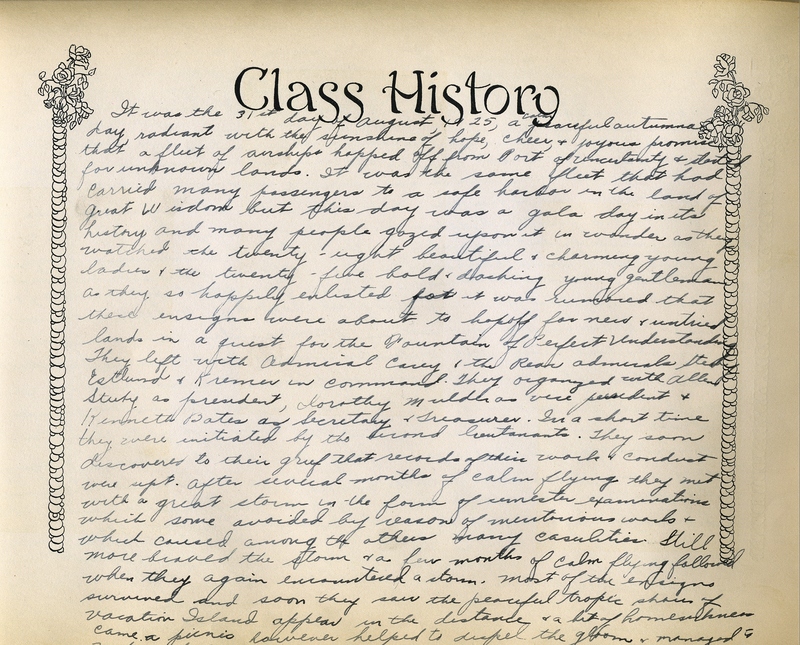 In it my grandmother (Lucille) Edna Mulder (later Edna Zuidweg) recorded the events of her high school graduation from Caledonia High School (Michigan), as well as a few clippings from her first year at Western Normal School in Kalamazoo. 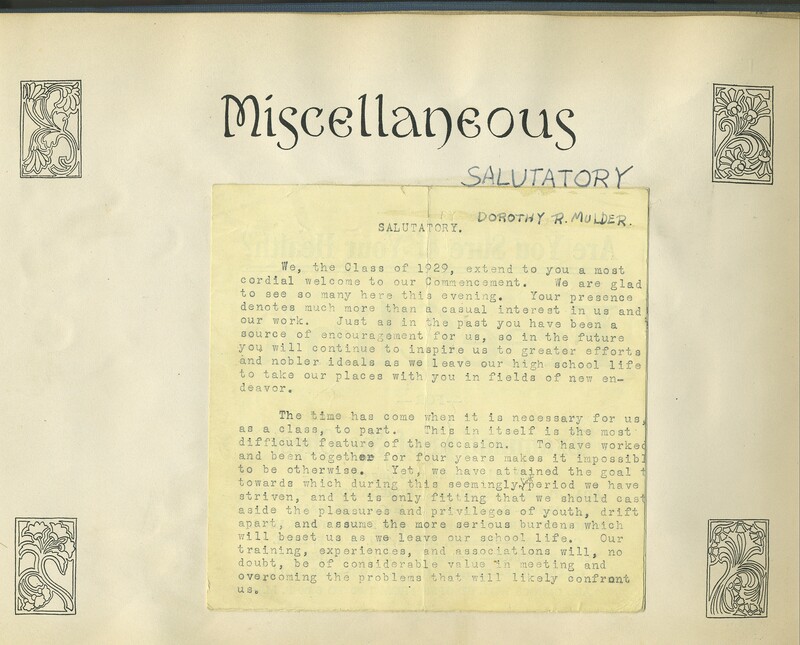 In 1929, my grandmother graduated a year early, at age seventeen, along with her older sister Dorothy Mulder (later Dorothy Plott). Grandma earned the 3rd highest GPA at 93.85% and thus was honored with the title “class historian.” Her sister was salutatorian. 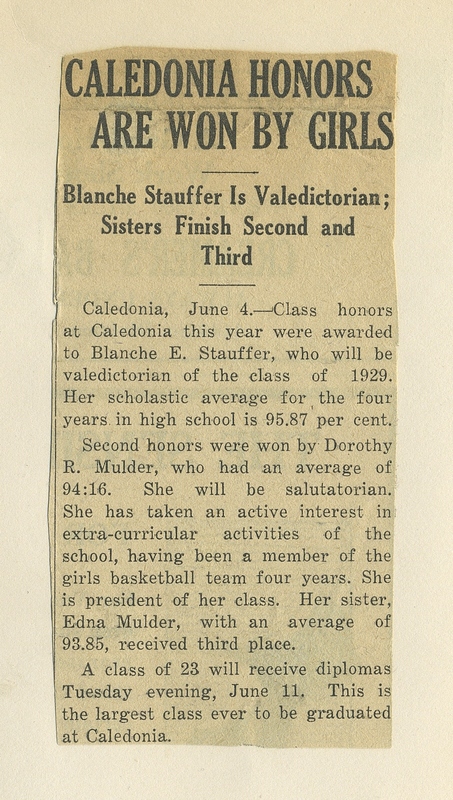 Grandma’s best friend Blanche Stauffer was valedictorian. 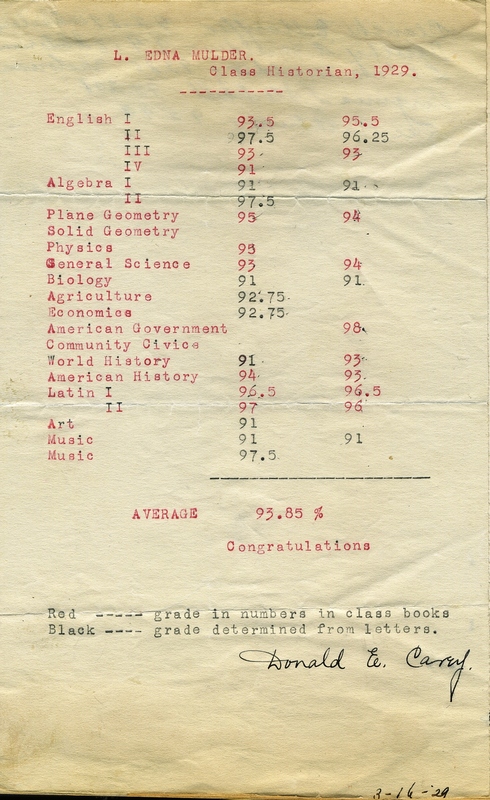 Clearly, grades were not inflated in those days at Caledonia High School. Grandma was the 2nd oldest girl in her family of three girls and two boys. When I was young and reading my mother’s copy of Little Women, Grandma told me she always thought that she was just like Jo, the 2nd oldest and the writer of the family. Her sister Dorothy was Meg, and her younger sister Alvena (called Vena, later Vena Stimson) was Amy. It makes sense to me that “Jo” would have been placed a year ahead so she could go to school with “Meg,” and that she would earn class historian to her sister’s salutatorian. 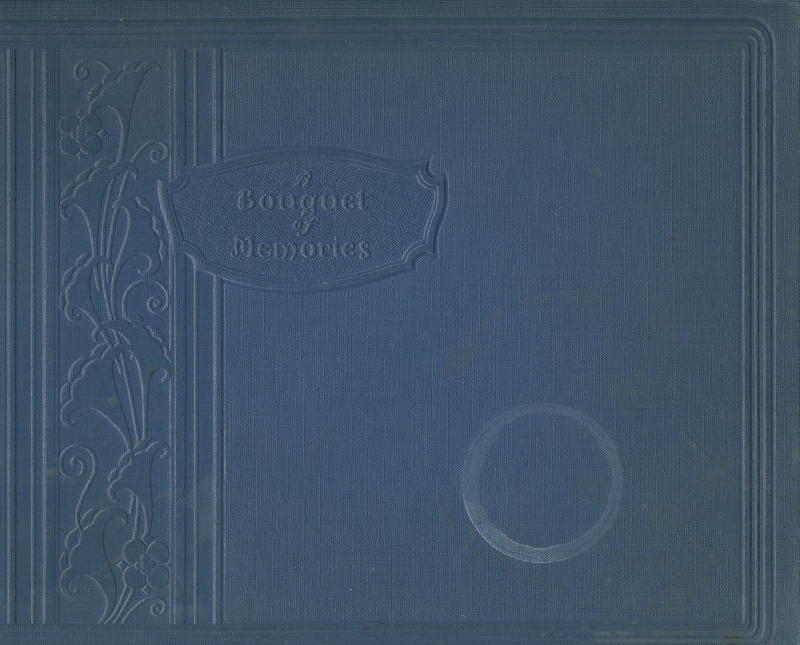 The scrapbook contains wonderful photos of Grandma, her friends, classmates, and teachers, but it doesn’t solve the mystery of who put that drinking glass ring on the cover. That scrapbook must be filled with amazing memories and mementos. I love the pictures you added… what history! The scrapbook is such a treasure, and until my parents gave it to me this year, I didn’t know it existed. There are lots of photos of Grandma and her best friends and her classmates. I wish I knew how to let the grandchildren of those classmates know about the photos! Grandparents can have such an amazing influence on our lives, can’t they. Mine encouraged me to photograph. Yours encouraged you to write. And, we both do those things. I think it’s a beautiful thing how they can continue to live on through us and through those whom we touch. A lovely post. Rickbraveheart, what a special sentiment! I’m so glad that you had someone to nurture your photography. It’s so true that they “live on through us and through those whom we touch.” Beautiful. What a lovely grandmother! I always have goose pimples on my arms when reading your stories, so rich and precious!! Thanks for sharing! Aw, Seyi sandra, that is such a sweet thing to say. Thank you so much for stopping by xo! Great post! I love the scrapbook and wish dearly I had more mementos of my Gram to pass on.